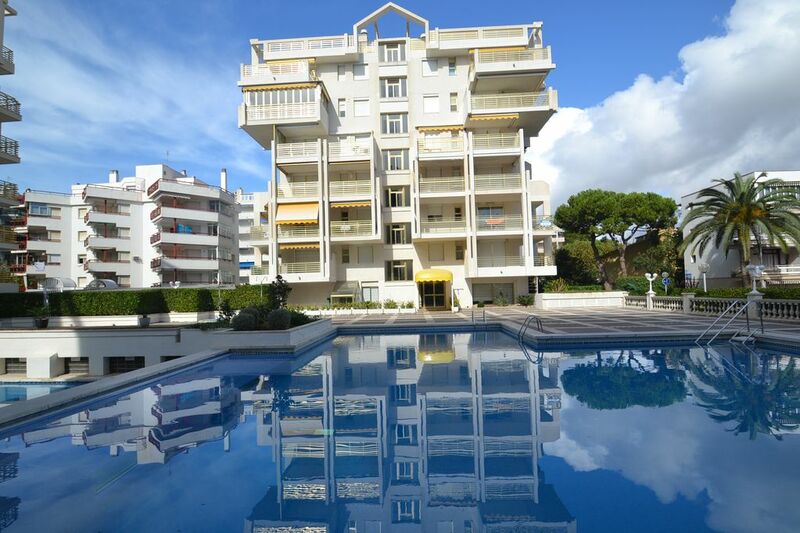 Air conditioned apartment, in a residence with community swimming pools, ideally located on the first line to the Jaume I maritime promenade amd to the famous Playa Llevant, Salou's main beach. This is a functional apartment, equipped for 5 people, which is made of one bedroom with double bed as well as a cabin with individual bunk beds, a kitchen with American bar which can be either opened up to the living room or closed thanks to sliding shutters, and a complete bathroom, recently renovated, with a big shower plate. This property is bright, thanks to two wide picture windows installed in the living room and main bedroom, both of them allowing direct access out to the covered and furnished terrace with table, chairs, rolling sun blind and storage closet. It stands on the first floor and the terrace is turned towards Calle Paris, a little one-way street, perpendicular to the beachfront. Extremely well maintained, this apartment is also entirely equipped with, between others, a dishwasher in the kitchen, the air conditioning and an Internet connection both included. As optional services, you can also get the linen (sheets and shower towels) as well as a private parking spot in the residence (to be confirmed in advance, available with the fee of 12 Euros per day). This property is perfect to enjoy holidays in the sun without having to use your car. World Vacances Plus is a booking centre between individuals, created in 1998 and installed here on the spot, in Salou. We are here to help you with finding a holiday rental which corresponds exactly to what you're looking for, depending on your enquiry criteria, expectations and needs, and follow you through all the steps of your booking, in English, until key collection; for this property, it will take place directly at the reception of the residence. Being here on the spot, we personally know each of our properties and their owners and can therefore perfectly answer all your questions. Ideal if you do not wish to use your car during your stay. To enjoy as much as possible combining beach and holiday residential complex with swimming pools. Privileged situation, facing the long fine sand beach and Jaume I maritime promenade in Salou with palm-trees, fountains, cycling and pedestrian tracks, shops of all kinds, bus stops, etc ... Family residence with big surveyed swimming pools (adults and kids), restaurant, 24-24 reception, elevators and night watchman. Very well kept property which provides with all the necessary comfort for your holidays. Port Aventura is only a few minutes from there, by car or with the resort's little tourist train which passes by the residence. Air conditioning and Wifi included. Well kept family residence with reception desk, caretaker, lifeguard, etc... Centrical situation to move around easily without using your car. Pedestrian and cycling tracks on the maritime promenade to go for a walk or ride, reach Cambrils, etc ... Especially well maintained and equipped apartment. Facing the fine sand beach, with swimming pools in the residence (for adults and children). Possibility to rent, in advance, a private parking spot in the residence, informing the landlords. toilet, shower, Recently renovated with a big shower plate. Optional parking spot in the residence: 12 Euros per day. Fully equipped kitchen with dishwasher and sliding shutters to keep it separate from the living room if necessary. Fully equipped and furnished terrace with table, chairs, storage closets and a big rolling sun blind to enjoy your meals outside yet in the shadow. There are elevators and access ramps in the residence and a large shower plate in the apartment. 2 swimming pools with a children's pool and a restaurant. Size: 12 x 9 metres. Lifeguard watching for it. 24-24 reception desk, surveying cameras and elevators. Possibility to rent a private parking spot in the residence with the fee of 12 Euros per day. A l'arrivée, les clefs nous attendaient à la réception, nous n'avons donc pas eu le plaisir de rencontrer les propriétaires, mais tout était parfait dans l'appartement. Il était nickel, pratique, avec tout ce dont on peut avoir besoin, proche de la plage et des commerces. Un peu trop proche peut-être: le magasin et le restaurant juste en dessous sont assez bruyants en soirée, mais ça reste supportable. Ca ne nous a pas empêché de profiter de la terrasse, spacieuse et d'où l'on peut même voir un petit bout de mer (j'ai déjà vu des appartements qui annonçaient "vue sur mer" pour moins que ça!). La piscine est très chouette, dommage que les maîtres nageurs le soient un peu moins: ils semblent nous avoir pris en grippe la deuxième semaine et n'étaient pas très sympas alors que nous avions toujours respecté les règles en vigueur... La mer étant de l'autre côté de la rue, ça ne nous a pas posé de gros problème! L'equipe de World Vacances Plus et le proprietaire de la location Novelty vous remercient d'avoir pris le temps de mettre un commentaire objectif et complet. 270 kms. from the French border. AP7 highway - exit 35 - Salou. Salou's train station: 1 km. Tarragona's HST station: 25 kms. Hints and tips will all be sent to you before you come along so that you can get organized. Salou is a renowned seaside resort located 100Km South from Barcelona, and is 10km from Tarragona and its cultural patrimony. The city offers all sorts of activities for tourists, the famous theme park Port Aventura, one of the biggest in Europe. Its equipement for entertainment turned it into one of the holiday places within the country. The touristy area well animated is located northwards, the paradise of the young holiday makers; families tend to appreciate the south of it which is more like a little village. There are about 8 beaches and creeks of sand connected with a long path line of palm trees.